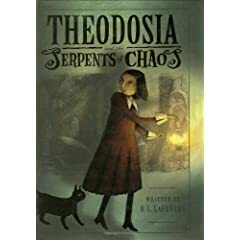 When her mother is away on archaeological digs in Egypt, Theodosia Throckmorton spends most of her time wandering around London's Museum of Legends and Antiquities, where her father is the Head Curator. While she does get a bit tired of sleeping in a sarcophagus*, she's never bored. I hurried past the looming statues until I reached the doorway that led into the Ancient Egypt Exhibit. Even though I patrolled this exhibit as often as possible, I could never be too sure what might be waiting for me in there. Magic is a tricky business, and the Egyptians were masters of it. Some spells seemed to regenerate themselves after a full moon or on specific unholy days. Others were only visible during certain seasons or when the stars and planets were aligned just so. All in all, Ancient Egyptian magic is a horrid jumble of sinister possibilities, and I never take anything for granted when dealing with it. Not that anyone would take the word of an eleven-year-old girl against that of the Second Assistant Curator--even if that girl just happens to be the daughter of the Head Curator of the museum and is rather cleverer than most (or so I've been told; oddly, I don't think they meant it as a compliment). As far as I can tell, it doesn't make any difference to adults how clever children are. They always stick together. Unless you are sick or dying or mortally wounded, they will always side with the other adult. Recommended for younger fans of Kiki Strike, Eva Ibbotson and any other readers who love plucky heroines, magic and mayhem. *When Mrs. Throckmorton is away, Mr. Throckmorton doesn't go home much -- therefore, neither does Theo. Bennett Madison needs your blonde jokes.